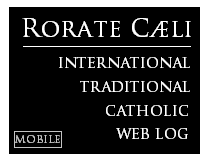 RORATE CÆLI: "An Act of Parliament, directly oppugnant to the laws of God and his holy Church..."
to the laws of God and his holy Church..."
"My Lord, when I was towards the law, the manner in such case was to ask the prisoner before judgment, why judgment should not be given against him." "More have I not to say but like as the blessed Apostle St. Paul, as we read in the Acts of the Apostles, was present, and consented to the death of St. Stephen, and kept their clothes that stoned him to death, and yet be they now both twain holy saints in heaven, and shall continue there friends for ever, so I verily trust and shall therefore right heartily pray, that though your Lordships have now in earth been judges to my condemnation, we may yet hereafter in heaven merrily all meet together to our everlasting salvation." Our regular feature on the Feast of Saints John Fisher, Bishop, and Thomas More - Martyrs. 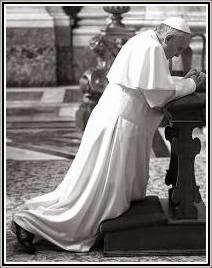 "Deus, qui beatos Martyres tuos Ioannem et Thomam veræ fidei et Romanæ Ecclesiæ principatus propugnatores inter Anglos suscitasti: eorum meritis ac precibus concede; ut eiusdem fidei professione, unum omnes in Christo efficiamur et simus. Per Dominum nostrum Iesum Christum Filium tuum, qui tecum vivit et regnat in unitate Spiritus Sancti, Deus, per omnia sæcula sæculorum. Amen." Saints John Fisher and Thomas More: through your intercession and in the profession of the same Faith and of the Supremacy of the Holy Roman Church, may all be and remain one in Christ!